Mashed potatoes are Uncle Mike’s favorite food; at family dinners he would spoon mound after mound of them onto his plate long after everyone else was done eating. Many people seem to feel the same way about these creamy mountains of starch, but is it possible something sinister lurks within, threatening some people with weight gain? To answer that question we first need to understand starch and its role in the human diet, as well as what happens to starch as we digest it, and how this process might differ in different people. 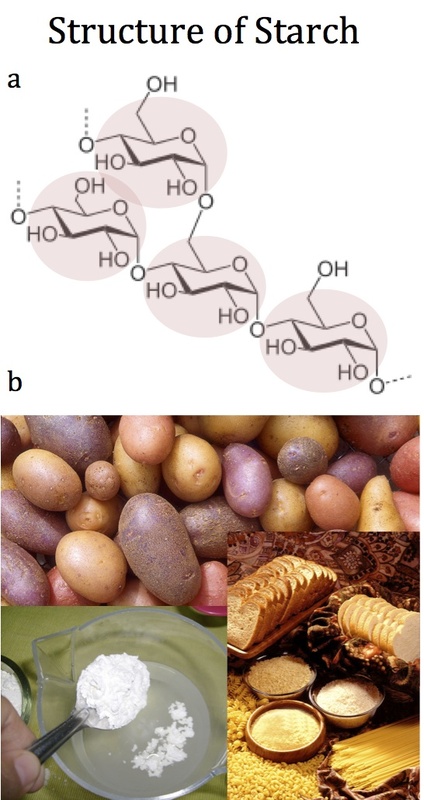 Starch, a principle component of potatoes, corn, pasta, bread, and rice, as seen in Figure 1, is composed of long, branching chains of glucose, which is a sugar and the primary source of energy for living cells. In fact, starch is so rich in glucose, it serves as energy storage for plants to help them survive when the climate is cold or dry. These starchy stores are also exploited by animals, like humans, for energy to grow, stay warm, fight illness, and reproduce. Figure 1 ~ (a) Starch molecules are long, branching chains of the sugar, glucose, linked together. Pink shading denotes individual glucose molecules. Image credit, modified from Wikipedia, Amylopektin Sessel. (b) Many plant foods, such as potatoes, pasta, bread, rice, and corn have high starch content. Purified starch, such as this corn starch, is a fine, white, tasteless powder. Photo credit, clockwise from top: Wikipedia, Potatoes, Starchy Foods, Corn Starch Mixed with Water. But, some human populations have historically eaten more starch than others. For example, humans living in tropical or arctic environments eat less starch than those living in more dry or temperate climates. This is because the amount of starch plants produce, and thus the amount that is available for human consumption, depends on climate . In tropical rainforests with plentiful sun and rain, plants have little need to store energy, focusing instead on capturing it by growing big leaves, and also growing rich fruits to attract animals to disseminate their seeds. Humans living in these environments, therefore, eat lower starch diets, consuming more meat, fruit, and honey. Additionally, arctic human populations in Siberia and northern Canada have little access to plant food at all, relying principally on animal foods. However, in somewhat dry or more temperate seasonal climates, plants grow large starch supplies, so humans living there have long dug for starchy tubers like potatoes as staples of their diets. Around 10,000 years ago, many of these populations cultivated plants like wheat, maize, and rice to maximize starch stores. This innovation actually changed how starch is digested in different people’s bodies—a divergence with serious ramifications for people’s health today. When starch is consumed, it dissolves into glucose molecules with the help of molecular machines, known as enzymes. Specifically, enzymes called amylases aid in breaking starch into glucose with the help of water. The first amylases to act are those found in the saliva, encoded in the genome (the full set of heritable material of an organism) by one gene, called AMY1. However, mistakes that happen when the genome replicates sometimes cause AMY1 to duplicate, so some people end up with many copies of AMY1—up to twenty! It turns out that people who have more copies of AMY1 actually produce more amylase enzymes in their saliva, and more efficiently digest starch in their mouths . This seems to have provided a nutritional benefit in populations who domesticated plants and increased starch consumption; over time these agriculturalist populations got more and more copies of AMY1, while the number of copies in non-agriculturalists has remained relatively low . This difference in efficiency of starch digestion in saliva also has surprising downstream effects on the body. People with lower efficiency of starch digestion and a lower number of AMY1 copies actually have more dramatic spikes in their blood glucose levels after eating starch than people with a higher number—even though people with a higher number of copies break starch into sugar faster . When food is digested into sugars, the sugars are absorbed into the bloodstream in order to feed tissues like muscle or fat around the body. In order for these tissues to take up glucose from the blood a hormone called insulin is required. Insulin is supposed to make sure tissues take up the energy-rich glucose from the blood, preventing blood glucose levels from getting too high and becoming toxic, as in diabetes. As it turns out, people with a lower number of AMY1 copies also have lower insulin levels after eating starch, so their glucose stays in the blood instead of entering tissues, which may explain why those people end up with bigger spikes in blood glucose levels [1, 2]. So maybe high starch consuming populations have become adapted to not only efficiently digest starch into sugars, but also use those sugars, keeping blood glucose levels moderate. Unfortunately, lower insulin levels and higher glucose spikes also relate to a risk of obesity. 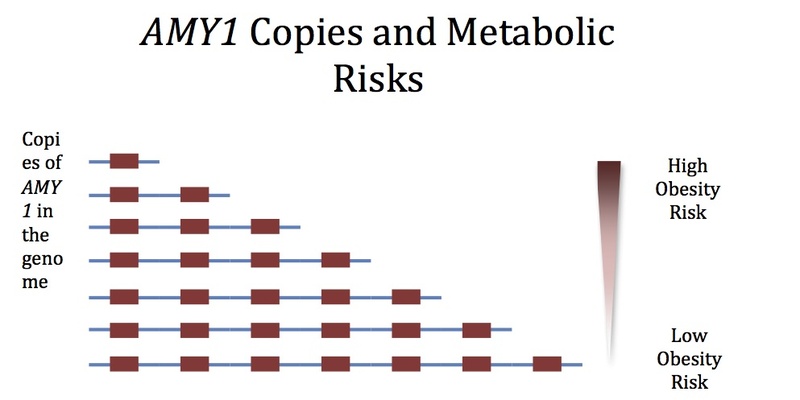 According to a 2014 study of over 5,000 people from Europe and Asia, each fewer copy of AMY1 was associated with a 20% increase in risk of obesity, as depicted in Figure 2 . Furthermore, variation in AMY1 copies may account for somewhere between 2.5% and 20% of all variation in risk of obesity among people. Prior to this study, all of the hundreds of genetic variants found to be associated with obesity accounted together for only 2-4% of the genetic risk of obesity, or less than 3% of the overall risk of obesity. Figure 2 ~ Copies of AMY1 in the genome for different individuals. Fewer copies of AMY1 increases risk of obesity and also impacts blood glucose and insulin—traits closely linked to diabetes. We still would like to know more about how starch affects health. Researchers want to figure out why exactly people with low amylase are at greater risk for obesity and insulin resistance, and how this relates to starch. For example, one study found that people can actually perceive the changes in viscosity of their saliva as the starch digests in their mouths . If starch digests too slowly in some people’s mouths, would they think it tastes bad? Or would they feel less full from eating starch? Researchers are also trying to figure out if salivary amylase has different important functions in other tissues, like fat, where it is also found at high levels . In spite of these mysteries, current research tells us two things. First, though huge variation exists within any given population, humans from different places are adapted to different diets, at least as far as starch is concerned. And, second, such adaptations can lead to vastly different health outcomes for people eating modern diets rich in processed, starchy foods. Uncle Mike certainly has never had a problem with eating potatoes, but I can’t really say if that’s because he’s an extremely efficient starch digester or because he’s been a champion runner since high school. Other factors like lifestyle and development also influence food digestion and obesity risk. However, studying what people’s ancestors ate and why people’s bodies differ in what they do with the food they eat will help tailor nutritional guidelines to suit individuals. Elizabeth Brown is a graduate student in the Department of Human Evolutionary Biology at Harvard University. Muneyuki, et al. “Latent associations of low serum amylase with decreased plasma insulin levels and insulin resistance in asymptomatic middle-aged adults.” Cardiovascular diabetology. 11, 1: 80. This is a useful (and interesting) post. Thanks. 1) How do you get tested for AMY1? 23AndMe won’t test for it. 2) What do you do about having lower amounts of AMY1? Possible options might be eat slower or avoid all starches altogether? One should see this is relation. First, AMY1 is the amylase expressed in saliva. There is also the AMY2 gene that is expressed in the pancreas. Copy numbers of the two vary, but the association of AMY1 with agriculture versus hunters is actually not that huge, when you look at the data in several papers. There is substantial overlap in AMY1 copy numbers between these two populations. Also, there is quite large variation when the amount of amylase is measured in salvia (AMY1) with copy numbers. There are many factors influencing AMY1 concentration in saliva (even just stress). Lastly, I recommend a later paper: Usher et al., 2015, in Nature Genetics, Volume 47, Number 8, August 2015, pages 921ff. The authors found NO association between copy number and BMI. I am convinced that potatoes, corn, all kinds of rice and grains including breads-wholesome or not and beans can kill me. I am 63, 125 lbs, 5’8” male and full of pep. I get very severe rashes from these foods. This started with Macrobiotics in 1983. I think they all lie and do not report how dangerous these foods are and how much sickness and diabetes and cancer they cause. I do not care what the cave man ate. I care to eat what is available to us now. Amputation freaks me out. I have rashes on the inside of both ankles. One healed almost. The other is still somewhat raw to a point where the fruit flies love to eat the bloody flesh and new skin. Yeh vegan authorities on youtube and the net refuse to allow the problems to be reported on their sites or videos. This is clearly manipulation of lies and distortions of borderline truths that lead to premature death. Most of the supercentenarians I have read about over 110 yrs of age followed no rules but remained thin and close to people. Eagles eat meat of freshly killed animals and can see about three miles as they look for their prey. Well, we are complicated and polluted animals that have been marketed to death to a point that we have no idea what is right anymore. I have an interesting situation I have a working diagnosis of periodic paralysis it is a disease where the potassium goes into the cells and cannot get back out because of mutations on the potassium gate. So when people with periodic paralysis eat carbohydrates it chases the potassium into the cell and it can’t get out. But I am able to eat all manners of sugars, candies even cookies and such I don’t have much troubles. But when I eat rice, potatoes, potato chips, french fries, doughnuts, and breads I become very weak hard to raise arms and legs slurring my words because everything feels so heavy. This can go on for hours or even days. The interesting thing is when I was in college in a lab they tested our salivary amylase and on two different times, 4 years apart, they found that I have no salivary amylase. My whole life I have always had to have fluids when I eat or I feel like I’m going to choke. Since I have been out of work for the last 7 years I have gained 50 pounds I always look at that as a fact that I am very inactive due to the weakness all the time. I wonder if I can talk my Dr into doing a study of my blood sugar before starch, directly after and an hour later just to see if what is going on is a huge Spike in my sugar. Previous Previous post: Can cinnamon be used to treat Parkinson’s disease? Probably not.